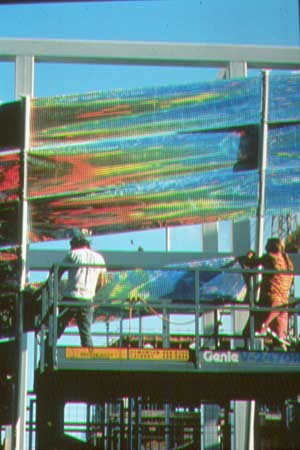 Painted steel structure, with Teflon coated, holographic diffraction gratings, which are in a reflective mode. 63 sectioned "sail" sweeps from horizontal to vertical axis and reflects sunlight, broken into its spectral components, onto surrounding buildings. This sculpture is the Gateway to The AGT Public Park.